This was a very busy month for us. 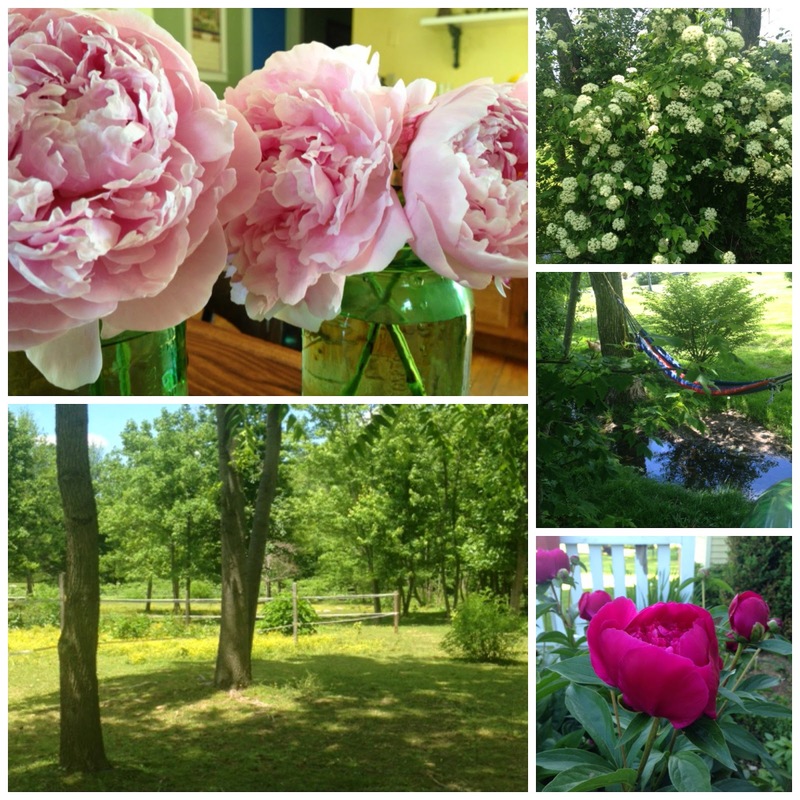 After a cold spring, June was a welcome gift! Everything started to bloom! We had our best crop of Strawberries ever! We had such fun at Knoebel's! My friend and I went to see the Downton Abbey Costume exhibit at Winterthur! An unexpected trip to Florida turned into a family reunion with fun at a tea shoppe and the beach! Lots of life happening here at the cottage. Beautiful flowers in bloom, children thriving, projects with friends, kids safely home from their youth conference. God is good to us everyday. We just need to have eyes to see Him at work on our behalf. I'm joining Cheryl @ Thinking About Home today for her great series Gathering The Moments. You can join us too, here. My cottage garden in the front of the house gets a bit wild every summer. Right now somethings are in bloom, and some are just beginning to bloom. Let's see what's happening in the garden. Ah, my poppies! They are spreading to different areas of the garden. A friend gave me seeds and now these self seed every year. Such a pretty color! Did I ever tell you about Tim 'weeding' these out of the garden one year? They had just begun to come up! Oh my! Luckily a few survived and now they are back and cheerful! This started to come up this year and I didn't recognize it. (I think I may have 'weeded' this out last year, but this year there was quite a bit of it so I decided to see what it was. Larkspur! I don't think I have ever planted it, but maybe my girls has some seeds? Anyway, this plant is a delight in the garden! Because it is tall I can see it through the front window! The Bees like it as well! Hospitality: Look What I Found! I've been on the lookout for a large drink dispenser, but was only coming up with plastic ones. One day I spotted one that looked like a canning jar, which is such a great look, but it was plastic too, and I was sorely tempted to buy it as it was a very good price. However, I opted to wait and I am so glad I did! When I'm in Florida, I always take a trip to World Market. Have you ever been to one? I really love this store but the closest one to me is in Rockville, MD, nearly two hours away. So instead, I drive 1,000 miles to go to one near my in laws! They have so many interesting things household accessories, furniture, candles, bath items, dishes, kitchen accessories, food from around the world, many kinds of tea and coffee. My girls love to go there because they may find a cute pair of earrings, or as Sarah did a gift for her friends birthday. She bought her a cute sealing wax and seals set for $9.95. It was the perfect gift for this friend. With Summer in full swing, and Rachel and Emma gone to a youth conference, I thought I'd take this week to be slow and relaxed. A few days of visiting with friends, and working on small sewing projects at home. Max, Emma, Rachel and Will before the headed out early Monday morning. Well, so far I've had the fun friend visits, one I ended up driving an hour to meet my friend who had some scheduling conflicts. Sometimes that is what you do to share time with a friend. So while it was not in my plan, it was a good thing. My friend who comes over on Monday afternoons, invited the kids back to her house for dinner and swimming on Monday, so Tim and I took the opportunity to go to dinner. That was very nice! We went to a local restaurant we like and sat outside in the beautiful weather. Such a treat. Dictionary.com says the following about the word Comfort. com·fort[kuhm-fert]Show IPA verb(usedwithobject)1.tosoothe,console,orreassure;bringcheerto:Theytriedtocomfortherafterherloss. 2.tomakephysicallycomfortable. 3.Obsolete. toaid;supportorencourage. noun4.reliefinaffliction;consolation;solace:Herpresencewasacomforttohim. 5.afeelingofrelieforconsolation:Herforgivenessaffordedhimgreatcomfort. We arrived home Friday afternoon. We stopped at a favorite restaurant, The Gallery Grille, to eat some lunch, then jumped right back into our normal lives. I unpacked right away, like I always do unless we are arriving late at night, or in the case of my trip to Scotland, when I arrived home rather jet lagged. Then Tim headed out to mow our property and Rachel and i headed to get some groceries. When we got back Tim was weeding the veggie garden and I picked lettuce. Yesterday was errands and normal life stuff, like a boy haircut, because he was getting shaggy, cooking, and a nice long talk with Emma when she got home from work in the evening. Today is church and prep for Emma and Rachel's trip to the youth conference - they leave early Monday morning. Our time here has been short, but long enough for now. We've filled it with fun and family. Tim's Mom has had these four kids of hers together for 3 days. It's been fun. We've gone to the beach twice, swam in the pool several times, watched the USA beat Ghana in the World Cup, had tea, gone to lunch, did some shopping. Mostly we've shared our hearts, watched our beautiful, talkative Mom, sit quietly very unusual for her. We got together for dinner at Tim's oldest sister's home, and took a few family photos. Dan, Virginia (Ginna), Mom (Jean), Esther, and Tim. Sarah, Anna, Kyle, Nicole, Grammy, Sara Anne, Rachel, Crystal and her daughter Miriam. These are just a few of her grandkids and one great grandchild of the four she has! Sorry for the poor quality of the photos, it was late evening, and low lighting. I will try to do some editing when we get home. We are thankful for this time we've had with them all. I can't begin to tell you how special this place is. I have been here many times when visiting my inlaws and have brought my mother here, my daughters, my friends. Yesterday, the ladies in our family that are here for our reunion, went together with our Mom/Grammy. She is going to be 93 in October and has, in the last several months, begun to develop short term memory loss. We are together here, as an opportunity for all her living children be together with her. We are thankful for this time. I should have gotten up and taken these next two photos with the light behind me, but I didn't. They all look serious don't they? 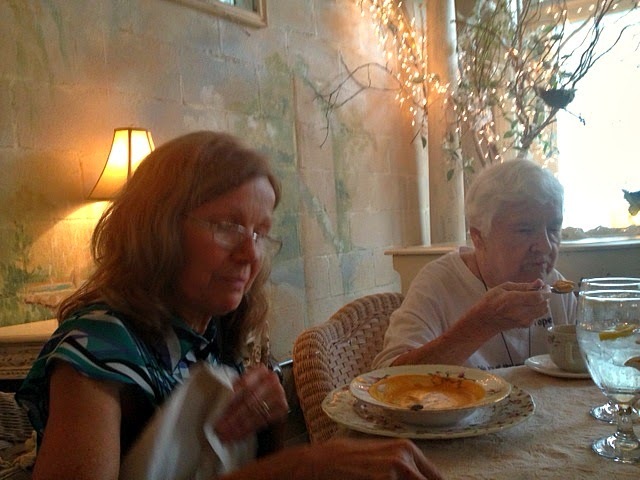 They were enjoying the Carrot Bisque soup. Sarah and Rachel love this tea shop and have been several times. This space used to be a garage! But with a lovely mural on the walls and sky blue ceiling draped with miles of tulle, it is a lovely space. Some of us are in Florida, to have a quick mini reunion. We are only here for three days, but are planning to make the most of it. After arriving yesterday, and going to lunch at a Mexican restaurant with Tim's sister and brother in law, we took the kids to Bethune Beach. It was lovely weather in the evening. We ladies (10 of us) are headed to Mount Dora today to eat lunch at the Garden Gate Tea Room. I'll be sure to take photos. We are taking Tim's mom with us! It will be she, two daughters, two daughters in law, and six of her 14 granddaughters. Hoping for a beautiful time.